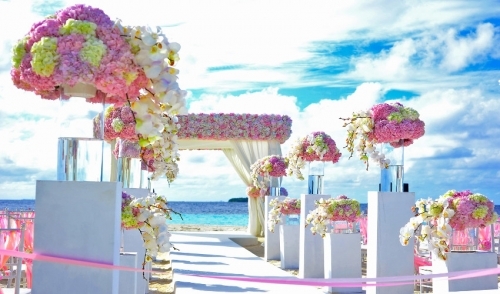 Do you have a wedding to attend to this upcoming Summer? Is it outdoors or somewhere where the sun is hotter than ever? Is it your wedding and are you nervous guests will be too uncomfortable? You’ve come to the right place – this article is suited for everyone who has a wedding to be at this summer. From linen suits to sunscreen, follow these tips and tricks to keep cool at your next summer weeding. Keeping cool at a wedding starts and ends with hydration. I say this at the beginning of this post to emphasize how important hydration is at keeping your body cool throughout the day and night. Think about the sun beating down on you, all of the dancing, and even the mental toll the wedding will have on you and how all these things can cause the body to heat up and make you sweat. Your body can't regulate temperatures well if you're not properly hydrated. Stay hydrated in between beverages and make sure you're drinking plenty of fluids to prevent any sort of dehydration. Don’t be afraid to keep a water bottle close by. I guarantee you anyone that doesn’t have one will wish they did. In conjunction with hydration, amp up your deodorant and sunscreen game. Wear antiperspirant and utilize sunscreen to keep cool and protect yourself from the sun. Both will help keep you dry during the day of the event and will help decrease the chances of any chub rub. ‘Chub rub’ is not fun and can really hurt your game on the dancefloor. Don’t hesitate to use powders, gels, creams or additional cosmetics to keep everything under control. One of the easiest ways to stay cool at a summer wedding is wearing suitable attire. There’s not always flexibility to wear something other than a black tie or suit, but some brides and grooms do recognize how hot it could be for their guests and will opt for something less formal. While less formal is pretty easy, if you have to wear a suit – pay attention to the materials. Stay away from thick wools and heavy cottons. Try to opt for a suit that is made up of a blend, linen, or other moisture wicking materials that are meant to be worn when it’s hot out. A 3-piece suit might look great in the mirror, but it won’t save you come the day of the wedding when you’re outside listening to the exchanging of the vows and sweating bullets. The final tip is to accessorize accordingly. Summer weddings are great events to break out quality shades, parasols, or fans to create your own personal cooling atmosphere. Fans can also be electronic and carried in your purse for extra convenience. On the day of the wedding, keep things simple and don’t worry too much. Worrying will only make you feel warmer and ironically cause more sweat. Relax and have fun at your next summer wedding to keep cool on both the inside, and out. For most weddings, the organizer will have extras in places such as tents for shade, water, and additional gadgets to keep guests as comfortable as possible. Do your part and use these tips to keep the sweat at bay and to enjoy your next summer wedding.